Christmas season is just around the corner! It is a wonderful time to decorate your entire house, inside and out and boost the holiday flair and cheer with decorations that call out the season. From DIY candy cane topiary trees to handmade sewing Santa hat chair covers, here are more than 30 budget friendly Christmas decor ideas that the whole family can get involved making and get everyone into the festive spirit!Most of these creative ideas have tutorials to follow and would surely help to bring more joy to your home this holiday season. Let the fun and great memories begin! Nothing says Christmas than a beautiful, festive wreath! 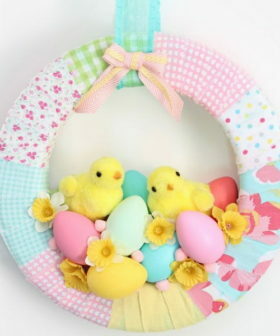 Check out to see how to make this mason jar lid wreath via Funky Junk Interiors. This creative snowman wreath is made with twigs, ribbons and Christmas balls, then dress it up with a hat and scarf. It looks so great on your front door. Turn the extra corks into a cork Christmas tree complete with a string of lights. It is so easy to make and it will add more rustic warm and charm to your Christmas. DIY tutorial via kj. Fill six mason jars of the same size with ornaments, tinsel, greenery. Assemble the jars in a pyramid, then wrap it with a shiny garland and top with a star. Perfect for a mantel or entry table decorating this Christmas. Via Country Living. Whimsical little decorations perfect for the holidays! You can also use real candy canes, it just might be a bit sticky but fun for the kids! Tutorial via pizzazzerie. Add holiday cheer and warm to your home with this easy to make ornament wreath! Simple but stunning Christmas door decoration idea! Via eddieross. Make a candy canes vase and fill it with red roses for an easy and cute Christmas flower table decor. More details and tutorial via My Eco Chic Wedding. Create this paper Christmas tree project and add a touch of rustic warm to your decor! Tutorial via Place of My Taste. So easy and fun to create this stunning and sparkly reindeer canvas art and add a touch of Christmas cheer. Get the tutorial via Mixed Method. Decorate your winter windows with beautiful hang Christmas ornaments! Easy, quick and fun to make! Via Stylish Eve. 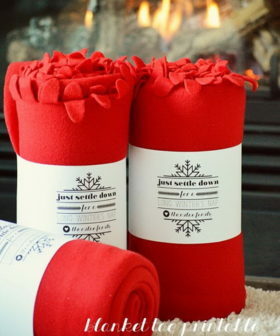 What a cute idea to add a festive look to your holiday party with these DIY santa hat chair covers! Get the tutorial via Diply. Make a surprisingly beautiful and super fun candy cane wreath this holiday. Full tutorial via The Crafty Blogs Talker. Use those old pallets together with decorations such as bulbs and ribbons to create this adorable lighted Christmas tree for decorating the porch or yard this Christmas. DIY tutorial via Red Head can Decorate. Make this beautiful and fun paper Christmas ornament with your family that will create lasting memories. Tutorial via DIY Ready. Budget-friendly DIY Christmas decor with dollar store! Get the tutorial via Youtube. Another great way to put your old ball ornaments to good use! All you have to do then is hang them from your window and you’ve got yourself a quick and easy decoration. Tautorial via Jaime of All Trades. This DIY advent calendar is the cutest way to pass the days until Christmas in style. DIY toturial via sisters suitcase blog. Transfer the old frame inot this awesome holiday wreath with some ornament balls in several steps! It is perfect for your front door to welcome guests to your home….Tutorial via artsy chicks rule. A great and beautiful way to showcase your special Christmas ornaments with this DIY pigeon hole display box! 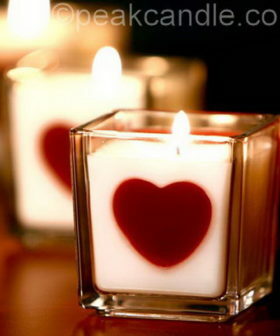 It will be an addition to your Chirstmas decoration this year! DIY tutorial via homedepot. Make this festive Christmas wreath with Christmas ornaments to match your holiday decor. It is super easy and quick to make under an hour. DIY instructions via mk-creations. Gift-wrapping the front door is a traditional way to get your home festive ready for the holidays. Look at this one, it will surely make a lasting impression for your new homeowners this holiday season. DIY details via nap time decorator. Place a pretty jar filled with red berries and a candle for a DIY mason jar lantern to light up the night. DIY tutorial via stone gable blog. Add some twinkle to your holiday and winter decorating with these easy DIY luminaries that you can make in less than a day! via pinterest. Creating unique Christmas scenes for front porches, walkways, or yards with this DIY wooden Christmas trees with marquee lighting. Check out the step-by-step tutorial via christmas lights etc. Add a little holiday spirit to your home with this DIY Santa & Reindeer Garland. It’s so easy to make with some dollar store supplies. DIY instructions via the proper blog. 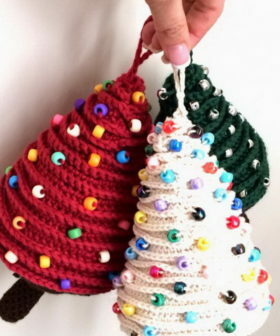 Another cute and inexpensive way to make Christmas trees with dollar store cones for your holiday decoration in style. Check out the instructions via sincerely jean. Add a rustic touch to holiday decor with this Christmas lighted garland made with burlap! See details via create craft love. This Epsom salt covered Mason jar makes a great addition to your holiday décor or Thanksgiving table. It also makes the perfect gift for several people on your Christmas list. It’s simple and doesn’t require many supplies. 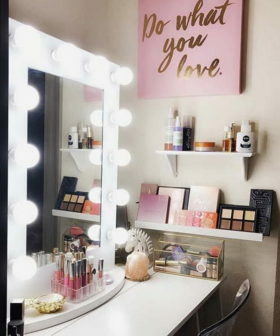 DIY tutorial via decoart. Create this festive garland with Christmas ornaments in the colors of your choosing. It will be a glamourous addition on the holidays. Video tutorial via youtube. Dress up your door with this colorful and festive wreath. It is both super easy and very quick to make with some simple supplies that you can find at home. DIY tutorial via delightfully noted blog. Get the DIY tutorial via the crafting chicks. Bring the festive spirit into your home by creating this Christmas canvas sign. Super easy and fun to make in an afternon. DIY tutorial via the 36th avenue. 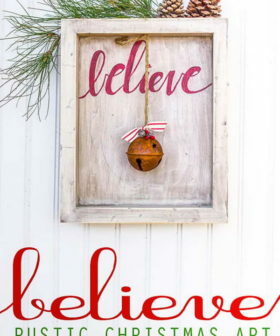 Add a touch of rustic charm to your Christmas decoration with this “JOY” wood sign! Tutorial via the netz family. DIY tutorial via mango juiced.